Feast your eyes on this TV's large display in crisp, detailed Full HD resolution. Image sharpness is maintained even in exciting and dramatic events, as it is tirelessly working on a 200Hz CMP processing system. 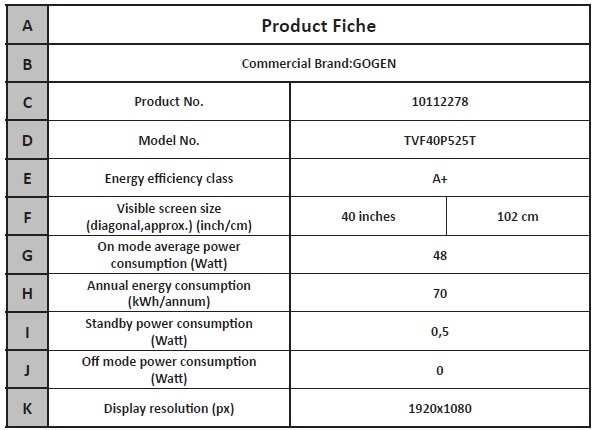 Featuring the latest tuner and low power consumption, the GOGEN TVF 48P525 T LED TV is an excellent investment for years of entertaining television with minimal operating costs. GoGEN is sure of its product quality, so it provides an extended warranty of 40 months. Just register at www.gogen.cz. The Gogen TVF 48P525 T will save you extra investment after the planned transition to the new DVB-T2 standard. This TV was tested by experts from Czech Radiocommunications, and the certification of this institution proves you won't have to buy any other tuner. The device is ready to suit your entertainment needs for years to come. TV Stand Gogen TV Wall Bracket 23"- 42"
TV Stand GoGEN Adjustable TV Mount for 23"-42"